Sync speed issues with Cactus V4 wireless flash triggers and the Lumix G1, Canon 5D and Olympus E-30 have been resolved. All triggers sold from now on "should be free from these banding issues" with these cameras. 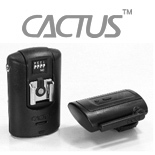 Hong Kong: Gadget Infinity, international seller of Cactus triggers and flash units, has announced improvements to the Cactus V4 wireless trigger system. We are pleased to announce that banding issues reported by customers using the Cactus V4 Wireless Flash Trigger on Panasonic Lumix DMC-G1, Canon EOS 5D, and Olympus E-30 have now been resolved. All Cactus V4 wireless flash triggers sent by Gadget Infinity beginning 21 June 2010 should be free from these banding issues. We would like to express our sincere gratitude to Panasonic Corporation, for extending vital help to and cooperation with our Cactus V4 Product to ensure seamless product compatibility and user experience.